Hume: New Ismaili complex will enrich Toronto - 2010-05-28 | Ismaili.NET - Heritage F.I.E.L.D. Of all the gifts ever given to Toronto, none is more beautiful than the Aga Khan’s. 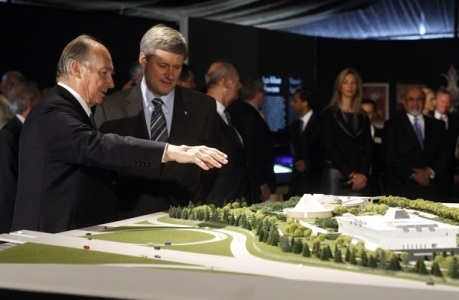 The spiritual leader of the Ismaili Muslims came to town Friday to break ground on a remarkable project that will include a museum of Islamic art and an Ismaili Centre, both set in an exquisite seven-hectare park. Created by some of the world’s most sought-after designers, the complex and its contents will bring new depth to Toronto’s artistic life and its vaunted multiculturalism. Most amazing of all, perhaps, the centre is at Eglinton Ave. and Wynford Dr., a part of the city best known for its dreary anonymity. By the time construction is finished in 2013, however, this will have changed completely. Intended for Muslims and non-Muslims alike, the $300 million Wynford complex will help shift the centre of urban gravity farther north than we have seen before in Toronto. Though respectful of the artifacts it will display, the museum will also be a flexible, up-to-date facility that meets international conservation standards. Simple, logical, elegant and unpretentious, it is organized around a central courtyard. In this sense, it makes subtle reference to traditional Islamic architecture. By contrast, the Ismaili Centre seeks to create quiet spaces more appropriate for prayer and spirituality than exhibition-going. The designer, influential Indian architect Charles Correa, is probably most recognized for his efforts to adapt Modernism to non-Western contexts. Based in Mumbai, he has produced a building that is actually a series of structures that house a library, social and prayer halls, classrooms and an entrance foyer. Extensive use of glass, including a glazed dome, will ensure natural light throughout. As much as anything, the choice of Toronto, if not Wynford Dr., represents a true act of faith — in this city. Since the 1970s, Canada has been home to tens of thousands of Ismailis, more than 28,000 of them in Toronto. Already, Ismailis have built landmarks in Burnaby, B.C., and Ottawa. What distinguishes the Toronto scheme is the museum, which will contain Islamic art and artifacts dating back 1,400 years. Drawn from the collection of the Aga Khan and his family, they range from manuscripts and miniatures to metalwork and textiles. The intention, the Aga Khan noted, is to illustrate the “plurality of Islam,” something about which North Americans could always stand to be reminded. As he also said, he hopes the museum will address the “clash of ignorances” so characteristic of our time. As optimistic as that might sound, there can be no doubt the Wynford complex will marshal the considerable powers of art, architecture and landscape in a way not seen before in Toronto. Considered simply as an act of city-building, it is unprecedented. Who else would have undertaken so ambitious a project? But if anyone can pull it off, the Aga can.